I love to teach preschool to my children with themes. So much that many years ago I actually authored a preschool theme schedule for the Sonlight PreK Core (before they wrote Teacher’s Guides for PreK). Right now, my twins and I are celebrating the theme of snow. We are reading snowy books, coloring snowy pages, and creating snowy crafts. 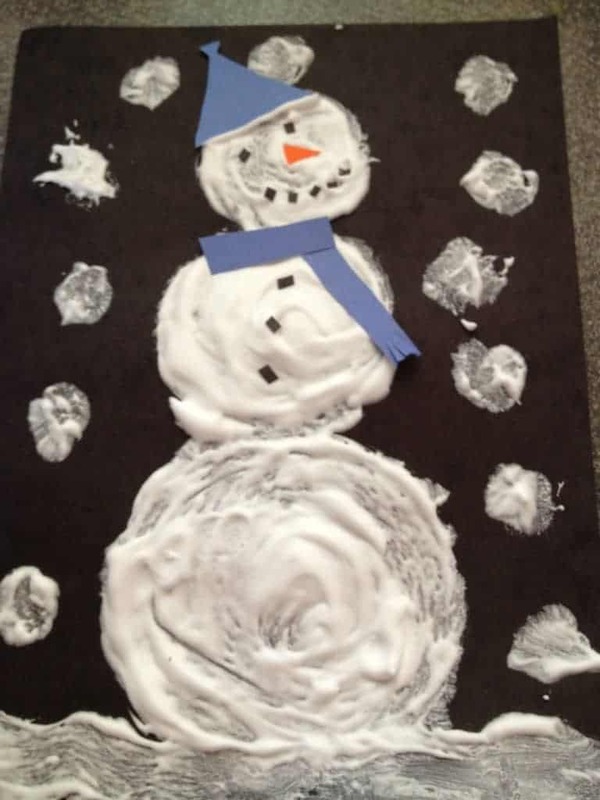 This week one of our suggested crafts in Learning Box Preschool was painting a snowman out of shaving cream. Unfortunately, it was just a suggestion with no real instructions. 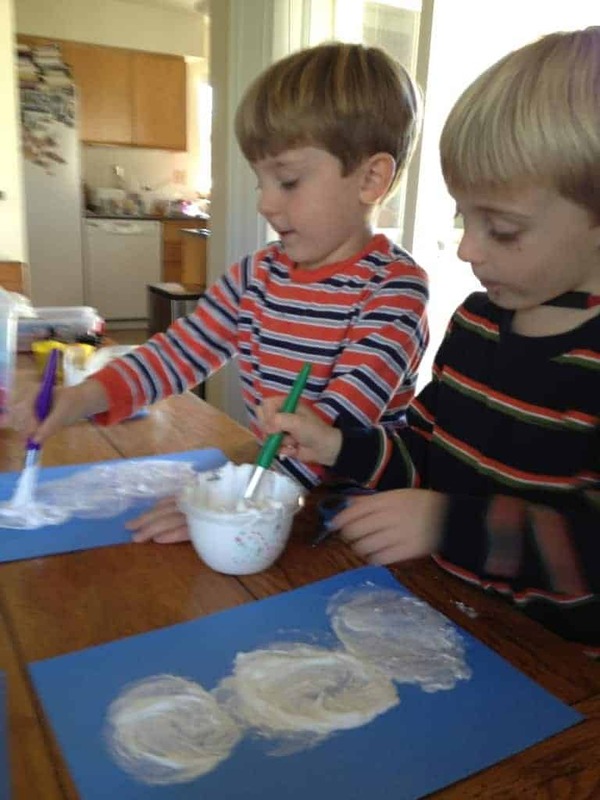 So here is how to make your own puffy paint and paint snowmen with your child. First, you need to gather supplies. 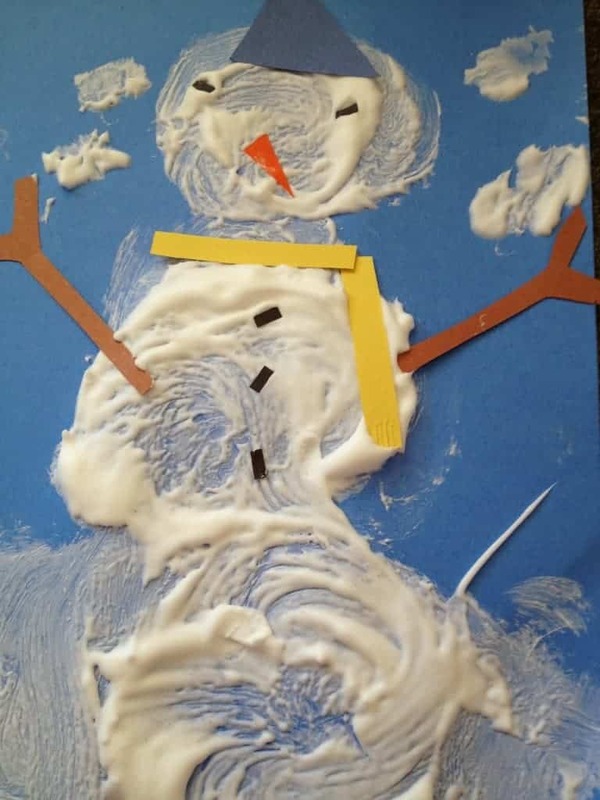 You will need shaving cream (not gel), school glue, blue or black construction paper for the background, black, brown and orange construction paper scraps for the snowman decorations, a small cup or bowl, a craft stick for stirring, and some paintbrushes. Second, you need to mix your “paint”. 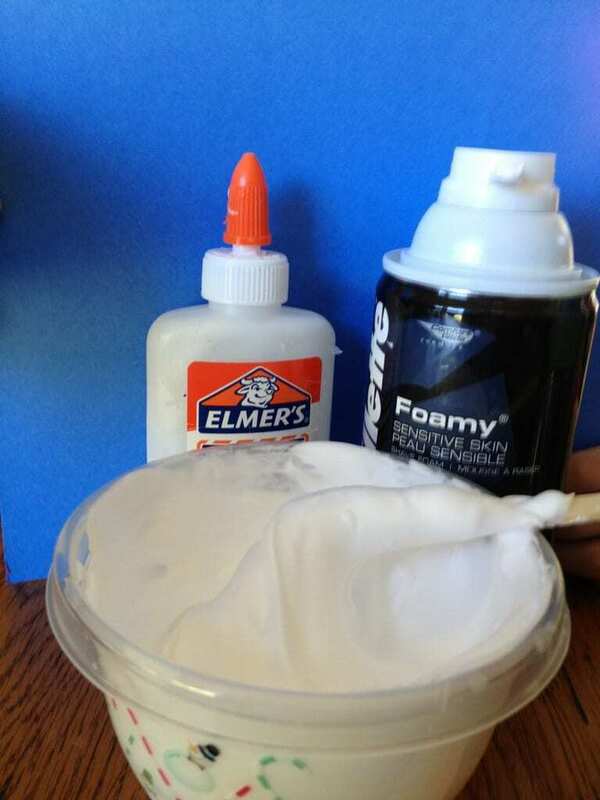 I used a baseball size squirt of shaving cream with about three tablespoons of glue. You don’t have to be real exact with measuring — it’s a pretty forgiving recipe. Third, you need to give some instructions to your preschool child. 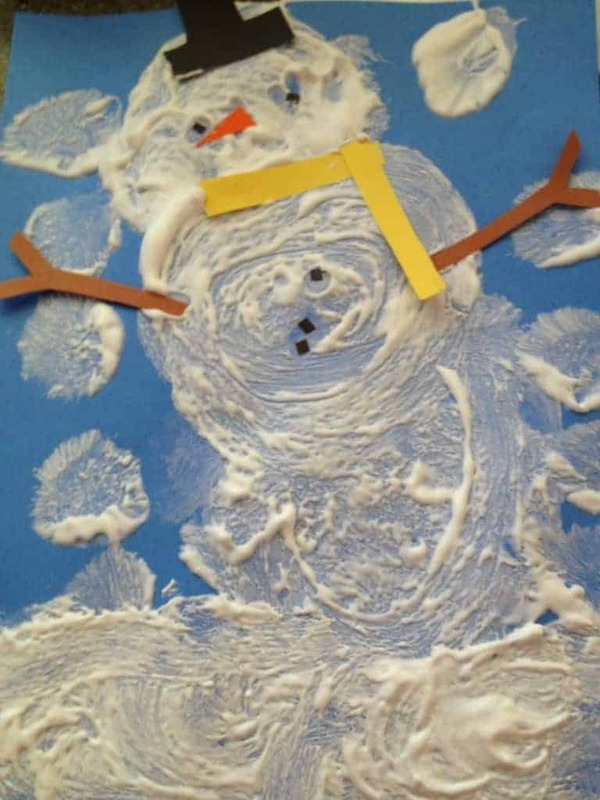 We started with “What parts are in a snowman?” We talked about the bottom, middle, and head. I asked what shape they would be (circle) and what color. I mentioned that the bottom would be the biggest part, and that’s how we would start. Fourth, start giving your child his supplies. I handed them the paper and a paintbrush first. Then I asked them to tell me which part they were painting first (the bottom) and which part was the biggest (the bottom) and what shape it would be. I talked them through each step of the way. Fifth, have your child start painting. 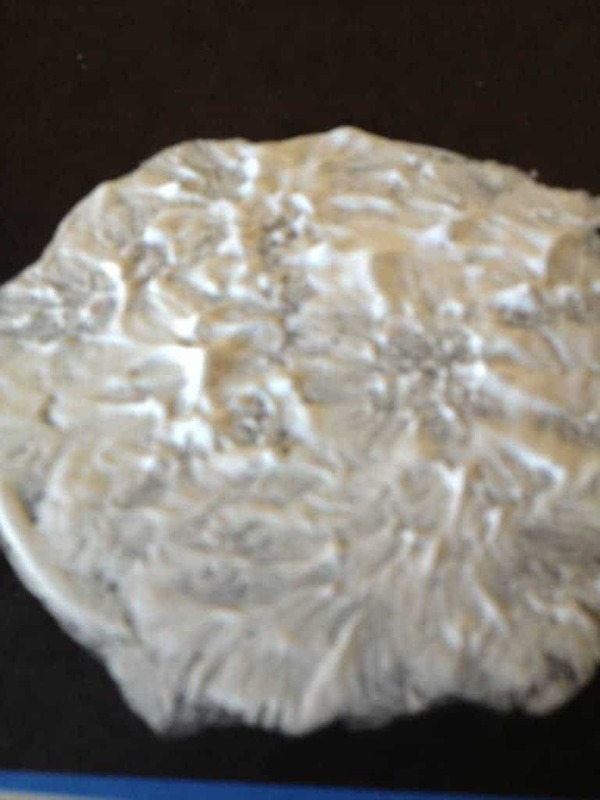 Help them make a circle to outline the bottom and then they can fill it in more thickly. Some of my kids liked to “stiple” the paint on (dabbing up and down) and some liked to smear the paint on in a more traditional method. Once the snowman is finished, you can add snow falling and snow on the ground if you wish. Sixth, finish by decorating your snowmen with eyes, nose, mouth, buttons, arms and perhaps a scarf or hat cut out of construction paper. That looks like such a fun snowman craft. how long is this mixture good for? if we wanted to do this for a kindergarten class and make it ahead would that work? I’m not sure. I used it within 20 minutes of mixing.